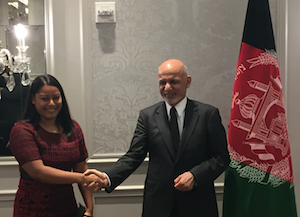 NEW YORK, NY (September 21, 2017) – Today, IAVA leaders and Afghanistan War veterans Tom Porter and Cinthya Fana attended a reception hosted by the President of Afghanistan, Ashraf Ghani. The visit follows President Ghani’s participation at the UN General Assembly in New York City. 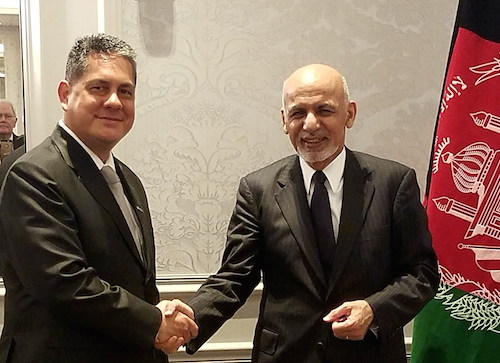 The reception was an opportunity for President Ghani to meet with veterans, families of the fallen, and servicemembers who have served in Afghanistan, to thank them for their service and share some of the gains Afghanistan has made because of their sacrifices. Porter is a IAVA’s Legislative Director, a Navy veteran who leads all Capitol Hill advocacy focused on issues like expanding veterans education, combatting suicide, and increasing recognition and services for women veterans. Cinthya served five years in the Army as a Human Resources Specialist and deployed to Afghanistan in 2012. IAVA is the only national veteran service organization headquartered in New York and represents over 400,000 members across America. 37% have served in Afghanistan.